Solis’ amateur records is nearly impeccable. A three time world amateur champion and one-time Olympic champion he never lost in a major competition and would likely having won another gold medal at the Olympics if the legendary Félix Savón (who went on the win the gold) hadn’t been entered ahead of him despite Solis defeating the already two-time Olympic champion in the trials. One of a wave of Cuban boxers who defected and turned pro in the late 2000’s, like many of his compatriots Solis began his professional journey in Germany and unlike most has remained there for his bouts, despite living among the Cuabn expats in Miami. With amateur credentials like that it was understandable why so many were excited by Solis. Although in his seven year pro-career so far, most of that excitement has faded away. That’s not to say Solis has had a bad career so far. Not at all. He’s 20-1 and won the vast majority of his bouts in a one-sided fashion. The one loss was to Vitali Klitschko and that was a fluke knee injury sustained in a first round where Solis appeared to be doing well against the then WBC titleholder. But there have undoubtedly been issues. The first thing to consider is who those 20 victories came against. There are some recognisable names in there… longtime fringe contenders Chauncy Welliver, Monte Barrett, Carl Davis Drumond and Ray Austin being the best examples… but has anyone really rated those guys for years? They were fringe contenders for a reason and over recent years the only time their name really comes up is when the lose to someone. Since the loss to Vitali it looked like Solis had given up almost entirely (not that differently to Juan Carlos Gomez), content to feast to low level opposition. I used the word “feast” deliberately. Because the second reason that Solis has seen his hype drained away is his weight. As an amateur Solis normally boxed at 200lbs and only in the latter stages of his career went up a weightclass. Yet as a pro his weight tends to fluctuate between 245lbs and 255lbs… and once went as high as 271lbs. Put simply, Solis is fat. Not podgy, not heavy-set, not carrying a few spare pounds. Fat. 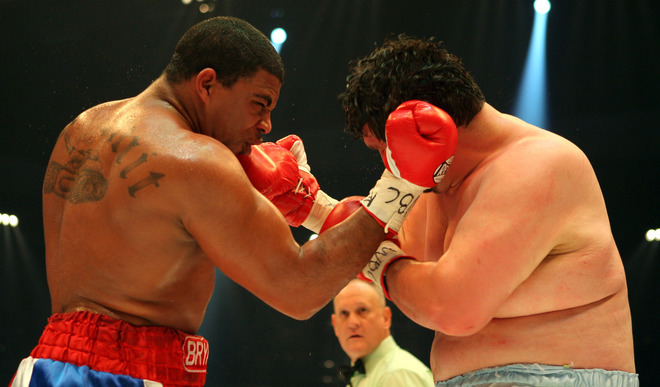 His best fighting weight is probably in the 230lbs… and yet even for a bout with Vitali he could only get it down to 246lbs (and then shot up to 261lbs for his next bout). Solis wouldn’t be the first Cuban amateur star to watch their weight increase and their boxing skill fade as they gorged themselves on freedom but considering his talent he may be the saddest case. The fact he is still able to be as good as he is despite carrying the extra weight and a reportedly haphazard attitude to training is a testament to how good he could be if he really knuckled down. At 33 Solis is still in pretty much prime age for a heavyweight. His skills have never been in question, simply his dedication. And if that can be sorted out he’s got the potential to not only compete with but to actually beat Wladimir… or any other heavyweight that steps into the ring with him. His first real test since the loss to Vitali… and likely his sternest test outside of the Vitali bout in his entire proffessional career… comes this Saturday against American contender Tony Thompson. Probably most famous for two brave but losing performances against Wladimir at 42 years old Thompson is clearly past his best but the tricky and hard hitting southpaw has seemingly taken on the role of being a high-level gatekeeper to the stars in the last year or so. British hopeful David Price wasn’t good enough to get past him despite two attempts. Bulgarian contender Kubrat Pulev was (despite not looking good while doing so). Now Solis has to test his mettle. Solis should win. Thompson is tall, awkward and still clearly carries power in both his hands. But he’s lost much of his speed and movement (be it of hand, foot or head) and his stamina is clearly fading. Despite his weight issues Solis should be too quick, too sharp and too powerful, able to pick the taller man off, counter him and avoid Thompson’s own punches. Throughout his career Solis has shown a nice jab, brilliant defence, good accuracy, a varied attack to the head and body and intelligent movement. That should be too much for Thompson. But if Solis comes in at 260lbs? If he’s slacked off in training? If he’s mentally already retired? I hope he doesn’t and he hasn’t. Normally I tend to prefer boxers like Thompson in bouts like this, boxers who haven’t had the breaks, who have had to fight and claw for every opportunity, who have to use skill and will to triumph over natural talent. But in this case I hope Solis wins. I hope he comes in at 240lbs and completely outclasses Thompson. Because a performance like that would be a performance that makes us take note. And it would be a performance worthy of Solis’ talent. This entry was posted in Analysis, Boxing and tagged Boxing, Odlanier Solis, Tony Thompson by consortium11. Bookmark the permalink.